Baking every Sunday morning has become a regular routine for me in the last few years, unless I was away from home. I just loved playing with flour in pastry, bread, cakes, dumplings, noodles etc…. The smell of bread and cakes in the morning is wonderful. 1. Mix the dough in a bread machine for 10 minutes. You can mix by hand if you want to. 2. Leave to prove for 40 minutes. Turn the dough out on a lightly floured working board. Give it a quick knead again. Rest for 5 minutes. Stretch it out into an oblong shape, fold forward and backward into 3 folds like an envelop. Shape and put into a greased 2 lb tin. 3. Leave it to rise in a warm area (quicker) or just on the worktop (longer), with a clean tea towel over it. 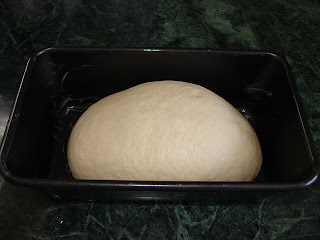 The dough will rise to 2 – 2 ½ its original size in about 40 – 75 minutes. If the temperature is cooler this will take a bit longer. 4. Preheat oven to 220 deg C (fan oven). Put the bread in and bake at 220 deg C for 5 – 6 minutes, then turn the heat down to 190 deg C and continue baking for another 25 minutes. 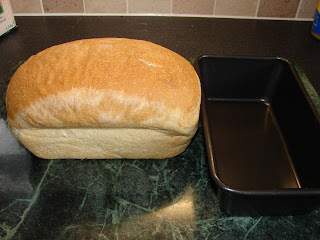 Take the bread out of the tin and keep the bread in the oven for another 12 – 15 minutes at 160 deg C, till the crust is hard. Leave to cool on a rack. Nice blog. Baking bread is my new hobby before I start blogging. My signature one is Olive bread. ANd recently I have tried to make chinese dumplings wrapping, I found the dough is more challenging than making bread dough.